High speeds even in hard-to-reach areas with Viasat satellite internet. Get the best tips on how you can get free installation and save $10/mo. Get $10 off voice service for 6 months when you bundle with Viasat internet. Want to get in on this deal before it’s gone? See if Viasat is available in your area with our simple comparison tool. Receive free standard installation with your Viasat internet package. Type in your zip code here to see if this Viasat deal is available in your neighborhood. Where it’s available: Viasat is available in all states except Alaska. To find out which Viasat plans are available in your area type in your zip code here. While other internet providers will increase prices for their plans every few months, Viasat stays consistent. Lock in your monthly bill with Viasat’s 2-year price lock guarantee, so you’ll never have to worry about unexpected price hikes. This provider also offers discounted rates for the first 3 months of service so you can save even more. You won’t be charged for using too much data with this provider thanks to their unlimited data plans, unlike other providers that put a limit on the amount of data you use. Where it’s available: Channel lineups and availability will vary by location. Type in your zip code here to see which packages are available to you. On Demand: Enjoy over 10,000 free On Demand titles. With the DIRECTV app, you can even take your entertainment experience on the go. Watch your favorite channels and titles on your smartphone, laptop, or tablet when you’re not at home. If you were to subscribe to multiple streaming services to watch all of your favorite shows and movies, you’d end up paying more than you would if you just bought a DIRECTV package. Plus, if you’re a big streamer, you’d end up using all of your priority data on streaming services, when you could be watching all of the same shows in one place on DIRECTV instead. Streaming on multiple devices at once will slow your Viasat internet down, causing lots of buffering and lagging. You won’t have to worry about slow internet with this bundle, because you’ll be able to watch TV in multiple rooms with DIRECTV, while using your internet connection for all of your other online needs. 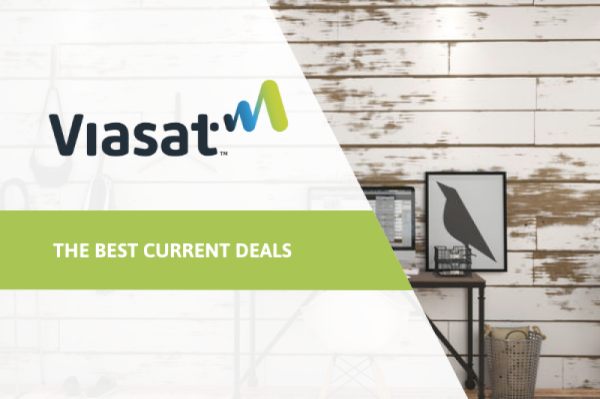 Where it’s available: The easiest and quickest way to find out which Viasat promotions are available to you is to use our comparison tool. On Demand: You’ll have access to more than 10,000 free movies and shows On Demand that you can watch at home or wherever you are. With this DIRECTV and Viasat internet bundle you can cut down on all of your online streaming services to save money. You’ll have access to all of your favorite channels in one place with DIRECTV. Several DIRECTV packages also offer a free year of NFL Sunday Ticket and 3 months of premium channels like HBO, STARZ, and SHOWTIME. While you can bundle DIRECTV with most internet providers, Viasat is a more affordable option than its competitors. For example, Hughesnet offers a 25 mbps satellite internet plan for a similar price; however, it only comes with 20 GB of data. All of Viasat’s plans have unlimited data, so you’ll get the most bang for your buck when compared to other satellite internet providers. Combine DIRECTV and Viasat internet and you’ll save every month. *New customers get reduced rate on your voice service for 6 months when bundled with Viasat Internet. **Limited-time free standard installation offer available only to new Viasat Internet customers. Offer requires credit qualification. Installation fees apply to those with lower credit ratings. Free standard installation offer is not available in all areas.